“There was no sign of a struggle, they whisper to each other. She took her phone but left her laptop behind. Apparently, she’d met someone online, they write to each other in class, phones buzzing. When Lizzie goes missing there are many suspects and many twists and turns that kept me reading. While this book does highlight the fact that we can never really be sure of the people we meet online and the dangers such relationships can bring, it was a very good read. A psychological thriller played out on school grounds, Facebook and even a local reality TV show. Aiden misses Lizzie who seems to have just vanished. While she appears to have gone willingly, all she took with her was her phone. No-one knows where she is or who she is with or even if she is safe and alive. Aiden and his best friend Scobie seek to find out what happened to Lizzie but the more they search the truth the more Aiden ends up in trouble himself. There were times when I felt sorry for Aiden but times when I wanted to shake him as he really could be an idiot and not the nicest of characters. However, I still wanted him to find Lizzie. This is a well thought-out novel with the pace perfectly teasing us at the end of each brief chapter until the very end. Social media today is everywhere and everything and this book is one worth sharing with teens in a classroom setting to discuss the dangers. But it is most importantly a good read for the thrill of the ride and one I enjoyed thoroughly. I must confess I do prefer the UK cover of this book coming out in August but I just have a feeling this is going to a book worth reading no matter what cover you prefer. It is certainly a book I will be looking our for when it is released. “Twenty-five years ago, Elmbridge High burned down. Five people were killed and one pupil, Carly Johnson, disappeared. Now a diary has been found in the ruins of the school. The diary belongs to Kaitlyn Johnson, Carly’s identical twin sister. But Carly didn’t have a twin . . .
“It’s about two (?) girls who live in the same body. No one is really sure if it’s a type of multiple personality disorder or if there really are two girls in there. One comes out during the day, the other, at night. 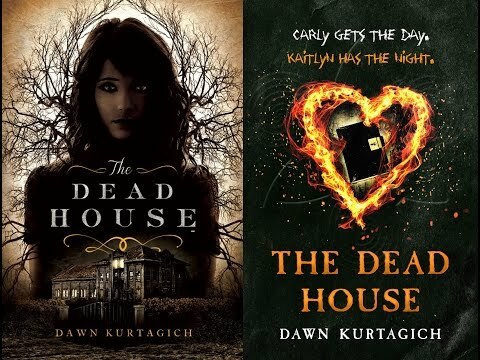 When the day girl, Carly, does missing, it’s up to Kaitlyn, the girl of darkness, to find out what is going on. But this might be more than simple personality “integration” as her doctor gleefully diagnoses. It might be something altogether more sinister. This sounds just the story I like and I can’t wait. Psychological thriller, mystery and as Dawn hints at – the supernatural. What more could you want! You can also listen to a podcast of Dawn talking about her new book right here. This is thanks to Publisher Weekly Podcasts. This sounds like a great psychological thriller, fast paced and full of suspense. I saw this book at one of my jobs today and was tempted to sit there and read it instead of working so I just have to ‘bag it’ instead so I can be first to read it. I was sent this link today and I really should wait until at least the end of May to showcase this trailer but I just know this is going to be a great book. The very well produced trailer hooks you in straight away. You can download an excerpt and get stuck in but then unfortunately you and I will have to wait until June to buy the book. Allen Zadoff’s website is also very cool and so is the book’s Facebook page. Boy Nobody is always the new kid in school showing up out of almost nowhere in a new town. “Mission accomplished, Boy Nobody disappears, and moves on to the next target”. A new assignment attached to the mayor of New York City starts him questioning things. Past memories begin to surface. Somewhere under all the memories is a boy that just wants a normal life. But what is the cost? I spied this book today drawn in by the cover and the title and began reading. Unfortunately I had to leave it at the place of work but I have put my order in to be first to read it. Fingers crossed it is released tomorrow as I really can’t wait to get stuck in. The writing hooked me in right from the first page. Jazz (Jasper Dent) has seen too much but with his dad finally in prison he can now live a normal life. That is until new bodies start piling up. And the finger of blame is being pointed at Jazz. 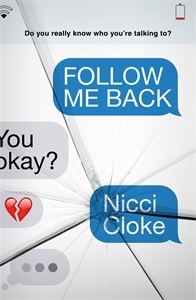 In an effort to clear his name Jazz helps the police to hunt down a new serial killer. But perhaps Jazz is more like his father than he realises? Game (Book 2) is just about to be published so I will have to hurry up and read the first one. 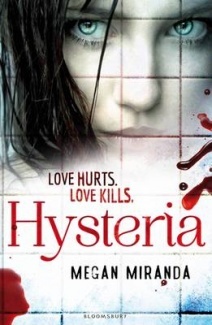 Hysteria by Megan Miranda : What waits in the dark? So cool to see this new trailer for Megan Miranda’s latest young adult book. Mallory’s boyfriend is dead. Mallory stabbed him but can’t remember anything of that night. Attempting to start afresh, her parents send her to boarding school but someone or something has followed her. She feels a hand on her shoulder late at night. She hears someone whispering out her name. Then a student is found dead and once again Mallory is the opnly thing people are talking about. Who or what is out there and can she escape her past? Check out Megan Miranda herself introducing her novel. Dark Eden series by Patrick Carman. Enter if you dare! Enter Dark Eden if you dare! Will Besting has phobias so severe he is sent to Fort Eden, an institution which is meant to cure him. There he meets six other teens connected by their fears. However, their phobias are not the only thing to be afraid of. Just what happens in the fear chambers and why are they suffering bruises and aches and pains. Will makes a break for it and while hiding begins to realise that things are seriously wrong but now he is being hunted. A psychological thriller. Read the books, download the Apps. Sixteen-year-old Faye arrives at Holbrook Academy, a place for those considered troubled, delinquent or crazy. After years of strange visions and nightmares Faye finds comfort in the bones of dead animals which only fuels her belief that she is indeed crazy. Faye also begins to find comfort in a handsome guy named Kel but soon begins to wonder if she can trust him or if he is just out to kill her. There is also the question of why her friends are waking up on their dorm floors with their hands stained red. An exciting new psychological thriller just published. Tags: Martyn Bedford, Psychological thriller. Fourteen year old Alex wakes up one day inside someone else’s body. He has no idea how six months have apparently passed overnight. Hi own body lies in a coma while he is now somehow in a body of a boy called Philip or Flip for short. He also discovers that there are other people who have swapped bodies. His new body offers more opportunities that his old one but he can’t help missing it. How can he find a way back? This is a great psychological thriller.